This infinity necklace is 40½ inches in length, shown as a double strand necklace here BUT intended to be worn as a long single strand necklace. Turquoise beads and oxidized sterling silver have been used in the creation of this set. 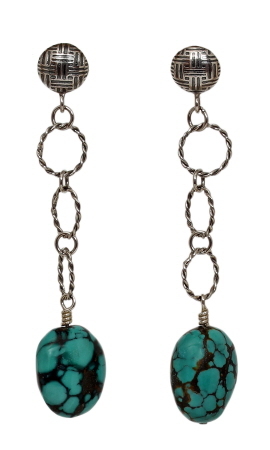 Earrings measure 2¾ inches from post to bottom of dangle and weigh 0.2 oz each.